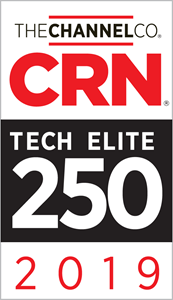 PHILADELPHIA, March 28, 2019 (GLOBE NEWSWIRE) -- Anexinet Corporation, a leading provider of digital business solutions, today announced that CRN®, a brand of The Channel Company, has named Anexinet to its 2019 Tech Elite 250 list. This annual list honors a select group of North American IT Solution Providers, each of which has earned the highest number of advanced technical certifications from leading technology suppliers. For the second year in a row, Anexinet’s Gold and Premium certifications from vendors such as AWS, DELL, HPE, Microsoft, Oracle, VMware, and more have earned the company a spot on the coveted list. When it rains, it pours! Today’s news follows closely on the heels of the company’s recent announcement of being named to CRN’s 2019 Managed Service Provider (MSP) 500 list in the Elite 150 category. This distinguished ranking honors Anexinet for excellence in Customer Engagement, Enterprise Mobility, Cloud & Hybrid IT, Analytics & Insights—beyond all expectations. CRN’s placement of Anexinet within their managed service provider hierarchy spotlights the company as a true leader in helping organizations provide a Complete Digital Experience for employees, customers, and end users. Everyone deserves a great digital experience. Anexinet (www.anexinet.com) is a leading technology consultancy and reseller, helping clients provide a Complete Digital Experience for end users. Anexinet's holistic approach ensures end-to-end coverage for customers—from engaging front-end interactions to dependable back-end solutions, all informed by data-driven insights. Because truly great digital experiences rely on the smooth operation of all interconnected elements: beautiful front-end applications, modern distributed architecture, private/public cloud, Dev/Ops and Agile/SAFE processes, and AI-driven analytics. Some companies focus on application design. Others handle your infrastructure. And then there’s Anexinet.